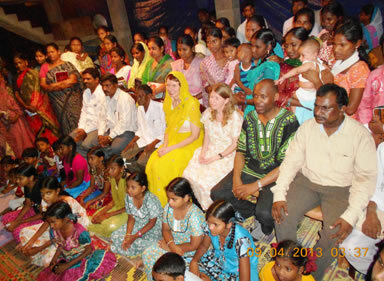 Our 2013 Indian Mission was conducted in two stages. Our April Mission had a large team of four ministers from Kenya, three from Uganda and two from Australia, we spread out around the nation to minister in churches and crusades before coming together with our Affiliated pastors for a conference in Hyderabad and opportunity for our Indian brothers and sisters to meet and begin fellowshipping with one another. Then in December we had a small team of just one from Kenya, one from Uganda, one from Australia and one from South Korea with a focus on spiritual warefare and breaking demonic strongholds to see the Indian church released into new levels of freedom, boldness and unity in preporation for the coming revival. Narela, Delhi: Rev. Venugopalan organised a Revival, Healing and Music event in the compound of the public secondary school – powerful ministry by Indian music and drama team then preaching by Sis Anita with Sis Davena and Pastor Roberts joining in praying for all who came seeking a touch from God. Narela, Delhi: Rev. 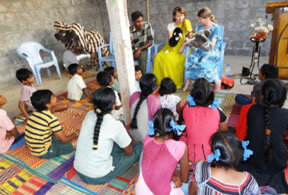 Venugopalan organised an outreach to Muslim children in the slum area through his Beatitudes Mission Centre - Sister Davena shared a powerful gospel message with the children using puppets and the Wordless Book. Pastors Roberts, Tom, Mathew & Benedict and Sisters Davena & Anita prayed for each of the children. Visakhapatnam, A.P. : Ev Raja Kishor organised for Pastor Peter to minister in different churches in different areas where he brought new revival to the churches and people were healed mentally and spiritually in each meeting. Hyderabad, A.P. : Pastor Joshua Oradi showed Sister Davena their sewing centre and shared their vision for empowering women through this centre. 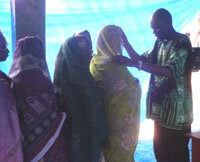 Sister Davena ministered the love of God to the women there. Visakhapatnam, A.P. : Pastor Changra Sekhar Yalla took Bishop Elias to services in different places, many people were saved and healed through his ministry. Visakhapatnam, A.P. : Ev Raja Kishor took Pastor Peter to minister in different meetings in different churches and he brought new revival to each one. 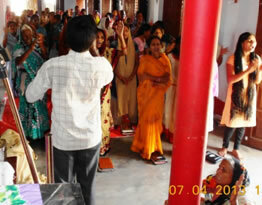 Puri, Orissa: Pastor Sanjay Limma took Pastor Tom & Sister Anita attended a powerful prayer meeting in the AOG church. There we heard the roar of the Lion of the tribe of Judah - so fervent and powerful were the prayers in that place, every demon from anywhere near had to flee. Sister Anita preached to this fervent congregation. Hyderabad, A.P. : Pastor Joshua Oradi – Sister Davena counselled and prayed for various ministers through the day then preached at the night youth meeting. and healed through his services. Visakhapatna m, A.P. 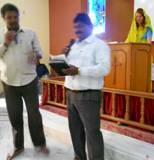 : Rev Prasada Rao – Pastor Peter ministered in four different churches up to almost 10pm. East Godavari, A.P. 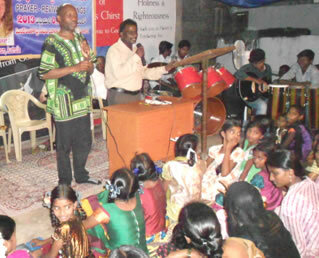 : Pastor Suresh Kumar – Pastor Benedict ministered in a night church service to people who had been waiting with great expectations. God moved in a mighty way that night with divine healings and salvations. The service ended up at 2:30am. West Godavari, A.P. : Phani Kumar – Pastors Roberts and Mathew ministering in the church of Phani’s pastor friend and Pastor Roberts preached powerfully in the evening service that went up to about 11:00pm in the night. Puri, Orissa: Ps Sanjay Limma - Ps Tom & Sis Anita attended house meetings in the fishing village. God healed people in the community through prayers and many people in the community asked Tom & Anita to come into their houses to pray for them. Hyderabad, A.P. 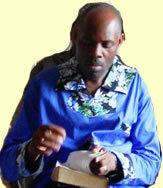 : Pastor Joshua Oradi – Sister Davena ministered in their Sunday morning service. In the afternoon she visited their orphanage (managed by one of Joshua’s brothers) and ministered to the children and prayed over all the staff. many people in the community asked Tom & Anita to come into their houses to pray for them. Visakhapatnam, A.P. : Pastor Raja Sekhar – Pastor Peter ministered in four different churches, one of which had been attacked and broken by a Hindu mob. East Godavari, A.P. : Pastor Suresh Kumar – Pastor Benedict was taken early in the morning to a church where one widow stays to minister to her and pray for her. 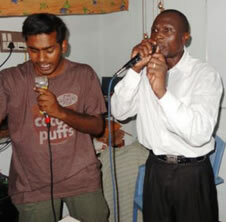 Suresh then took him to minister in two churches. In the evening Benedict ministered to the women and then at 8pm they went to another church and ministered until about 11:30pm. Again God healed people and many ca me to Christ and some were filled with the Holy Spirit. West Godavari, A.P. : Phani Kumar took Pastor Mathew to minister at King of Kings Ministries and ten people gave their life to Christ after hearing his preaching. 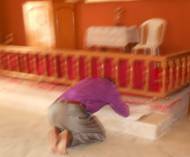 Pastor Mathew prayed for each one. Visakhapatnam, A.P. : Pastor Blessings – Bishop Elias ministered in different places, many people were saved and healed through his services. West Godavari A.P. 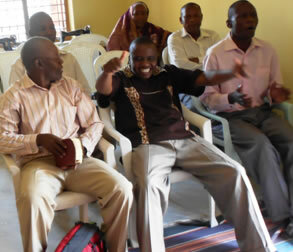 : Pastor David Livingstone Illuri conducted a revival crusade in his church. Sisters Davena and Anita preached on the love of God and Pastor Tom joined in praying for the many people who responded to the message. Several people gave their lives to the Lord. and ministered in a leprosy home. Krishna District A.P. : Pastors Pandu, Rajaratnam and Evangelist Essaku jointly organised a crusade - Pastors Mathew & Roberts ministered to the people. Many people got saved, and healed of various sicknesses. East Godavari, A.P. 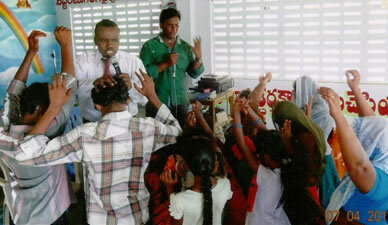 : Pastor Prasanna Babu – Pastor Benedict ministered and God powerfully touched the people as he prayed for them. West Godavari A.P. 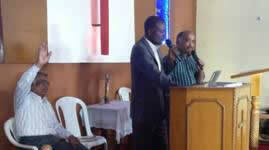 : Pastor David Livingstone Illuri – Pastor Tom taught in the Church from 11:00a.m till 4:00p.m. 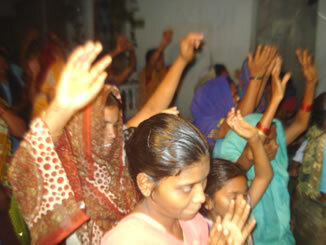 Then Pastor Tom preached in a Holy Spirit power-packed revival meeting that night in the same church. Healing, deliverance, manifestations of the Holy Spirit and people accepting Christ were experienced. God moved in amazing ways. Many lives were changed for the glory of the Lord esus Christ. Krishna District A.P. : Pastors Pandu, Rajaratnam and Evangelist Essaku jointly organised a mighty crusade - Pastors Mathew & Roberts ministered to the people. Miracles of salvation, healing and deliverance took place. East Godavari, A.P. : Pastor Prasanna Babu – Pastor Benedict, Sisters Davena and Anita ministered in a Pastor’s Conference with Sister Anita preaching and all praying for the pastors and serving food to them. Sister Davena ministered lovingly to the orphan children Pastor Babu is caring for, using puppets, the Wordless Book and lo ts of fun games. 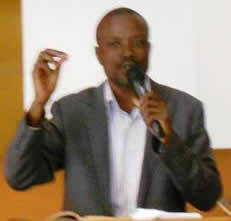 Pastor Benedict preached powerfully at the night revival meeting and many were touched by God. West Godavari A.P. : Pastor David Livingstone Illuri– Pastor Tom ministered at their branch village church with a teaching session from 11:00a.m - 4:00p.m. 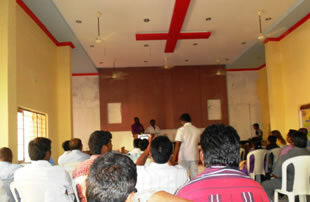 That night he preached in a revival meeting which was attended by hundreds of people. People gave their lives to Christ and God healed/delivered many. West Godavari A.P. : Pastor Ratna Kumar – Pastor Peter and Bishop Elias preached to 30 pastors in a pastors meeting and shared wonderful messages. East Godavari A.P. : Pastor Suresh Kumar – Sisters Davena and Anita ministered God’s love to the women and children at two sewing centres in the afternoon. 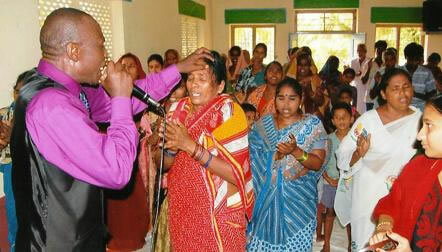 That night Pastor Suresh took them to minister at a church and then an outdoor revival meeting. Krishna District A.P. : Pastor Pandu Maddala - Pastors Mathew & Roberts were joined by Pastor Benedict and all three visited a slum where very poor and destitute people dwell and ministered to them. There wasjoy in that slum. The slum dwellers came out in large numbers to join them on what was more less a crusade. They had no musical equipment but many people gathered. 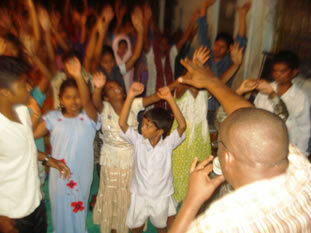 That night they ministered in a Hindu stronghold in Vijiwanda. Pastor Benedict preached and they all prayed for the people. It was a tough area but God gave them the victory. West Godavari A.P. : Pastor Ratna Kumar – Pastor Peter and Bishop Elias ministered to the FEED Ministries church people who greatly enjoyed their wonderful messages. Affiliates Activation Conference in Hyderabad - Pastor Joshua Oradi and his family did a wonderful job of organising and catering for this conference. The Indian pastors worked together very effectively in sharing the load of translating and it was wonderful to see God building the bonds of love and fellowship between those who seek His face. Day 1 teachings focused on our personal walk with Christ. Our first session started with Pastor David Kisaame teaching on Cross Life, which is the foundation of all we are and all we do. Pastor Mathew Ondicho then ministered a powerful message on Prayer, exhorting us to a deeper walk with God and full trusting in Him for everything. After a delicious lunch we were led into more praise and worship, both Indian style and East African style. In the night session Sis Anita ministered on Holy Fire from Isaiah 6:1-8 and there was a time of repentance when many came to the alter to lay everything down before our Holy God. We finished with worship then everyone fellowshipped together over another delicious meal. Affiliates Activation Conference in Hyderabad – Day 2 teachings focused on ministry, both as individuals called to minister and as the church advancing the Kingdom of God. We began the day with prayer and worship. Pastor Tom Opiyo laid some strong foundations for ministry with his teaching on The Role of The Pastor. For our second session Pastor Peter Kasibante taught on Effective Leadership, emphasising the need for strong communication skills to reach people where they’re at. For our third session Bishop Elias Akenga taught on the Maturity of the Body of Christ. For our final session Pastor Roberts Muwadi taught powerfully Advancing the Kingdom of God by Force and some pastors got the revelation of pushing the enemy back off their ministry, the churches and out of India through prayer offensives and bold witness. Pastor Roberts had packed many copies of his books “Be Healed” and “The Military Anointing – conducting strategic spiritual warfare to advance the Kingdom of God” to give to the Indian pastors but these were all lost with his missing luggage. However God’s promise to him before he came on the mission that his books would be translated into other languages could not be stolen by the enemy - Pastor David Livingstone Illuri came up to him after his session offering to translate his books. This will be a great blessing to the church in India to have these books in their own languages. Hyderabad, A.P. : Pastor John Sanderao welcomed Pastor Tom to worship at the Indian Pentecostal Church of God, founded by Pastor Philip Abraham in 1955, and they asked him to come back again to preach. Hyderabad, A.P. : Pastor Joshua Oradi invited us to join in their Sunday morning service. 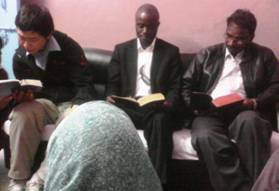 After some wonderful prayer, praise and worship Indian style pastors Peter, Elias, Roberts, Mathew, Benedict and David led some worship East African style and Sister Anita preached from Acts Chapter 4 that they already have everything they need in Christ to win India for Jesus. Sister Davena was invited to minister to many neighbouring women and God touched them through her prayers and demonstrations of His love. The missions team gathered for a time of de-briefing and reflecting on the mission. Out of their time together came many recommendations of Indian pastors who are strong in the Word, humble in spirit, capable in organisation and with a servant’s heart who would make good coordinators for the Fellowship in India. This time together also brought forth many suggestions and recommendations for future missions. Narela, Delhi: Rev. Venugopalan took us to minister to his daughter’s school principal and her whole extended family – an influential and wealthy Hindu household. The whole family of eight adults gave their lives to the Lord Jesus Christ and God healed one of the women from migraine headaches. Late Monday night we left for the airport to begin our journeys home. WEDNESDAY 11th DECEMBER all arrived safely in Delhi and enjoyed a fruitful time of prayer together. THURSDAY 12th DECEMBER We met early for prayer before going our separate ways to begin this mission. . In the taxi on the way back to the airport for the flight to Tamil Nadu God spoke to me that what was sown in tears in April would be reaped with shouts of joy during this mission. Pastor Ben and Sis. Anita flew to Trivandrum Airport in Kerala State and were warmly welcomed by Pastor Albert Singh and driven through this lush, tropical region to his home in Kannyakumari District, Tamil Nadu State, where we enjoyed sw eet fellowship with his family. 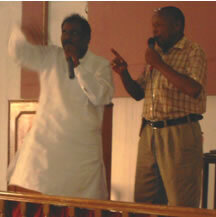 Narela, Delhi - Pastor Roberts and Bro. Samuel travelled to Rev. 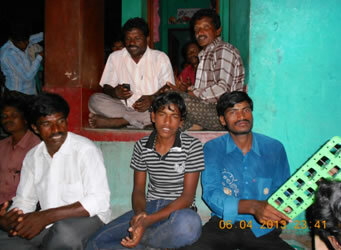 Venugopalan’s and they enjoyed a fruitful time of sharing the gospel with some Hindu women. Samuel was surprised at how responsive they were to the gospel. Even though the house was decorated with many idols and gods whom the woman served this woman and her friends seems to already have some knowledge of what is true. One of the women in particular was very eager to listen and adopted a positive attitude. It was a very meaningful time. 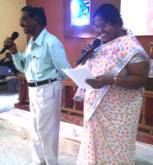 Kannyakumari, Tamil Nadu: Pastor Albert Singh - Pastor Ben and Sis. Anita both preached the Word for the branch church morning prayer meeting where all enjoyed the wonderful presence of God. Then prayed for those who came with needs. Samuel was told that the family where we got together took apart some times of every day to know God through reading the Bible and praying. One young girl has been waking up around 4am to pray every day, this really encouraged and challenged Samuel. That night they were invited back to minister to the Hindu women. Kannyakumari, Tamil Nadu: Pastor Albe rt Singh - Pastor Ben and Sis. 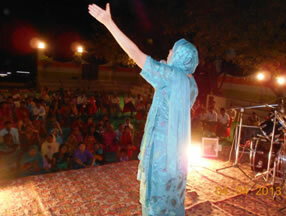 Anita both preached the Word at the Healing Crusade held in the main church. God ministered to the people there in a mighty way, there was great impact from the Word. Pastor Roberts and Bro. Samuel caught their flight to Hyderabad and were warmly welcomed by Pastor Joshua as he collected them from the airport (this time no problems with rogue taxi drivers or missed flights). 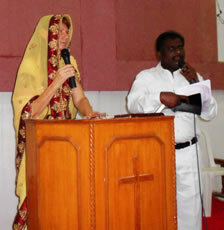 Kannyakumari, Tamil Nadu: Pastor Albert Singh - Pastor Ben and Sis. 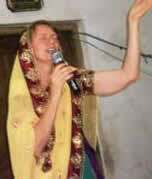 Anita both preached at the Pastor’s Conference and all were greatly encouraged and built up by the Word of God. 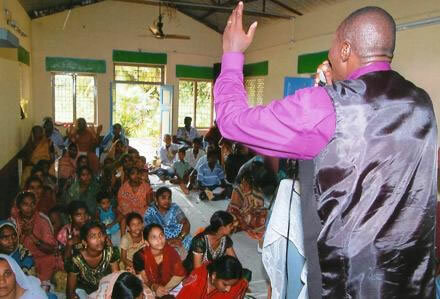 Kannyakumari, Tamil Nadu: Pastor Albert Singh – Pastor Ben and Sis. 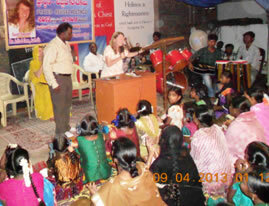 Anita again preached at the evening healing crusade and prayed for all who came with needs. The Holy Spirit ministered to the people. Hyderabad, A.P. : Pastor Joshua Oradi – Pastor Roberts shared a powerful message in their Sunday morning service, after which one man came to him to ask for prayer to be born again. Praise God! Ps Roberts also asked Ps Joshua to invite this man to the Conference. 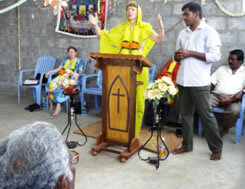 Kannyakumari, Tamil Nadu: Pastor Albert Singh - Pastor Ben and Sis. Anita both preached powerful words in the Sunday morning service for Pastor Albert’s main church and the people were touched, challenged and en couraged in t heir walk with God. Pastor Ben and Sis. Anita boarded their flight to Hyderabad where they were warmly greeted by Pastor Joshua, Pastor Roberts and Samuel. This evening was spent in prayer and preparation for joining with our Indian brothers and sisters for prayer and fasting to demolish strongholds and every high thing that exalts itself against the knowledge of God in India (2 Cor. 10:3-6). MONDAY 16th DECEMBER ... 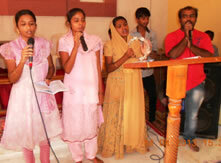 Prayer and fasting for India – Day 1 Our morning was spent in worship and prayer for the Indian church. Our Indian brothers and sisters started arriving in the afternoon. We all joined together for an evening time of prayer, teaching on Ezekiel 22:30 and dedication to the task ahead. TUESDAY 17TH DECEMBER ... Prayer and fasting for India – Day 2 Our day was spent in worship, prayer and the Word with an afternoon focused group discussion to help develop prayer directives for the following day. We saw God beginning to do a work this day. We spent the night evaluating all that had happened through the day and preparing for the following day’s program. We gathered in prayer early in the morning in preparation for the day’s program with our Indian brothers and sisters. Our day was spent in worship, the Word and praying through the issues identified during the previous afternoon’s focused group discussions. With great joy we saw strongholds being demolished and real transformation begin to take place. Late afternoon focused group discussions targeted what would help propel the gospel in India. The mission team spent the night evaluating all that had happened through the day, giving thanks to God for the great things He had done and preparing for the following day’s program, confident that the good work God had begun would embrace all who come to the Pastor’s Conference. THURSDAY 19th DECEMBER Our team joined for early morning prayers in preparation for today’s conference. Joining together ministers from the north, south and east of India was challenging with the different languages involved and trying to ensure that everyone could hear what was being said in their own tongue but it was also very fruitful and such a blessing to see the unity God built bo th within the groups from each state and between those from different areas. The ministers from Andhra Pradesh (with Samuel from Korea providing the beat) led us into our first session of worship for the day in such a powerful way that it brought everyone together and into God’s presence ready for what He wanted to impart to us. 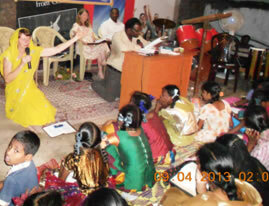 Pastor Venugopalan from Delhi led us in prayer then Sis Anita shared the Word and the vision of RMF. 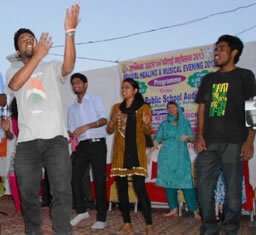 Our second worship session was led by the Delhi group. Pastor Ben then preached a powerful message to revive and help everyone realise their own life in Christ and in the ministry, prayed for the people as they broke themselves in the presence of the Lord and he involved everyone in activating the prophetic gifts of God within them as national revival began with personal revival and equipping for ministry. We enjoyed fellowshipping together over the lunch prepared for us by Pastor Joshua Oradi and his family. 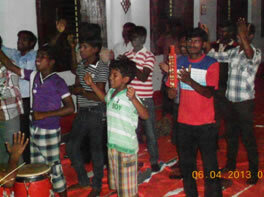 Our afternoon worship session was led by our Tamil Nadu ministers with Pastor Joshua and his team providing the music. Pastor Roberts then preached a powerful sermon confirming everything Pastor Ben had preached (they had not conferred before on what they would be preaching and Pastor Roberts had not been able to be in attendance for Pastor Ben’s preaching) – this brought much encouragement as God confirmed His Word and cemented the truths in everyone’s hearts. He then led us in a time of fervent prayer as we continued pressing forward into victory for India. Following our Tea Break fellowship Sis. Anita led a session on demolishing the false identities that the Devil tries to put on us and establishing our true identity in Christ. We broke into small groups to discuss who God says we are in His Word and then a representative from each group shared their findings with us all. Far from being a sub-class of ‘poor pastors’ below the cast system we discovered that God has placed us in nature, position and authority far above the whole cast system. From this place of authority we then proceeded to intercede for revival in India. Our team spent time evaluating and giving thanks for all God did through this day and preparing for Day 2 of the Conference before joining with everyone as we participated in Pastor Joshua’s semi-Christmas celebrations and the meal shared with his church members and community. FRIDAY 20th DECEMBER: Our team joined for early morning prayers in preparat ion for day 2 of the conference. 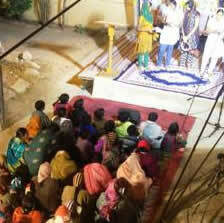 Our program began again with worship and prayers led by our Indian brothers and sisters. Then Pastor Roberts brought an encouraging Word that involved many sharing testimonies of God’s goodness. Our A.P. women led us into further worship. Then Pastor Ben brought a reviving Word on the resurrection and unbinding of Lazarus. We enjoyed fellowshipping together over the lunch prepared for us by Pastor Joshua Oradi and his family then further worship before the appointment of our first co-ordinators for India. 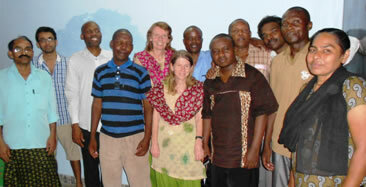 Much prayer and seeking God’s will went into the selection of our first co-ordinators. As the role of the co-ordinator involves bringing together in fellowship those around them we are staring with co-ordinators in the districts that have the most active RMF Affiliates - the eastern districts of A.P. State. As God brings in more ministers from Uttar Pradesh, Rajasthan, Delhi, West Bengal, Hyderabad, Odisha, Tamil Nadu, Kerala and Karnataka we will be able to establish co-ordinated groups there as well and even into the states not yet represented in our fellowship. To co-ordinate the A.P. districts of Vishakhapatnam & East Godavari we commissioned Pastor Chandra Sakha and his wife Victoria MaryGrace, to be assisted by Pastor Jeevan Babu in the East Godavari district and Evangelist Raj Kishor with special responsibility for Odisha (Orissa). All those in these districts gathered around to support and pray for these appointed to serve them. To co-ordinate the A.P. districts of West Godavari, Krishna and Guntur we commissioned Evangelist Pandu Maddala and his wife Mery, under the encouragement, prayers, support and wisdom of his father Pastor Rajaratnam. All those in these districts gathered around to support and pray for these appointed to serve them. Following these commissionings we had a time of reflecting on God’s great love for us and then joining together for our last time of united prayer for India in this Conference. Our Conference ended with impartation and commissioning of all for their ministry in India then all joining in prayers for the missionary team who came and thankfulness to Pastor Joshua for hosting us, and most of all, rejoicing in God for His goodness and the great things that He had done through the Conference and is going to do through all who attended. As the fellowship grows hold an annual conference in each state. Have these annual conferences publicised and open to those outside our fellowship. We need to pray for a breakthrough in finances to enable all this. Pastors Ben & Roberts to build mentoring relationships with key leaders in the Indian church. Pastor Roberts to keep Indian churches informed of the details of the training op portunity that is coming to India in 2014. Encourage ongoing fellowship with one another through the co-ordinators. That night those Conference delegates still available joined the outreach street Semi-Christmas celebration conducted by Pastor Joshua’s church and enjoyed the wonderful performances by the Sunday School children. 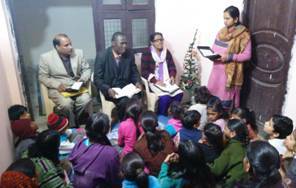 SATURDAY 21st DECEMBER: Remaining Indian pastors returned home and missionary team returned to Delhi for the final stage of our mission. On arrival at Delhi Pastor Ben and Bro. Samuel went with Pastor Prakash while Pastor Roberts and Sis. 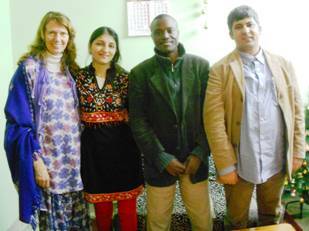 Anita were warmly greeted and collected by representatives of the Afghan refugee church and taken to Pastor Obaid’s home. 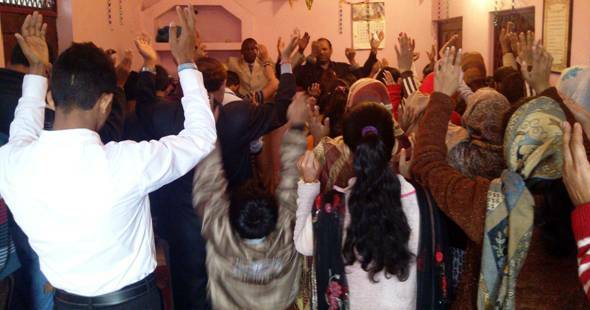 Pastor Obaid’s church had an outreach Christmas celebration that afternoon which Pastor Roberts and Sis. Anita were invited to but being tired from the intensity of the previous week’s ministry chose to rest instead – except that God had other ideas and instead employed us in praying for Afghanistan and His persecuted people there. That night we joined Pastor Obaid and Tarana as they took small presents and visited the home of one of the Afghan believers for a Christmas celebration with them, several other members of the congregation also joined for this time of fellowship, worship and encouragement. Pastor Roberts shared on the power of prayer to change a nation, citing the removal of Uganda’s tyrannical Islamic president as an example of God turning things around when His people continually cry out to Him in prayer from their place of persecution. Pastor Ben and Bro. Samuel joined with Pastor Prakash’s church for their Sunday service and they saw God at work as Pastor Ben preached and prayed. During the worship Samuel noticed a man that he thought might be one of the church Deacons or Elders but learned after the service that he was the Hindu owner of the building but that he comes to church occasionally and appears to be becoming more open to the gospel. 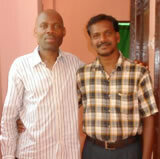 Ps Ben encouraged Ps Prakash to lead this man to Christ well. Pastor Roberts and Sis. Anita attended a morning service of Delhi Bible Fellowship with Pastor Obaid and Tarana – they remain members of this traditional evangelical church that mostly consists of expats and helped support the founding of their Afghan church. In the afternoon we joined the Dari Worship Service of the Afghan Church of New Delhi (they also have a Pashto Worship service on Wednesdays and an English Worship Service on Fridays). This is a close-knit church that supports one another through the most trying of circumstances and actively reaches out to the Muslim Afghan community with the love of Christ despite receiving death threats and beatings. Most of the congregation have given up everything in coming to Christ – family, possessions, homeland. They have had to flee Afghanistan as the government there has been cracking down on conversions to Christianity with ministers publicly calling for the death penalty to be rigorously applied. (Sorry, due to safety and security concerns, no photos of this congregation were taken. Even in India they are not safe as multitudes of Afghan Muslims are also moving there to escape the sectarian violence in their own nation and bringing with them the determination to beat and kill any Afghans who have come to Christ. 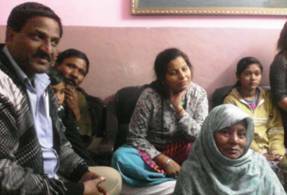 Several of the congregation have been attacked and received death threats while in Delhi. The UNHCR is also very slow, and in some cases refuses, to grant them refugee status so some are also living in fear of being arrested and returned to Afghanistan as their visas have expired while waiting for their claim as refugees to be assessed. I met one woman who, with her children, has been waiting over 6 years to be given refugee status – during which time her passport has also expired so she is officially an illegal non-person in a land that is not welcoming to Afghan Christians, not able to return home, not allowed to stay in India nor allowed to go anywhere else. Even once they get refugee status this only provides them with protection from being deported back to Afghanistan, nothing else, it does not give them so much as an ID that they can use to open a bank account or even get a sim card for a phone – India does not accept them as residents so they have no rights to work or start a business or do higher education and the UNHCR does not provide any support for them as they wait in non-existent cues for some nation to accept them – Australia has rejected Pastor Obaid and Tarana twice now even though they have much documentary evidence of the death threats against them and attacks they have suffered in Delhi and have been sponsored by large groups within our nation they were still said to “not meet our criteria” to be accepted as refugees. This situation cries out for continued prayer from Christians on all nations. 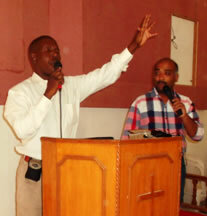 MONDAY 23rd DECEMBER: Pastor Prakash took Pastor Ben and Samuel to a fellowship pastored by an Indian woman. Pastor Ben shared the Word. After sharing the Word, Ps Ben Prayed for each one of them. The lady who clothed pink cried out when she was prayed and Ps Ben said God will do something through that lady. He encouraged the lady Pastor that this church will grow quickly and has something special. 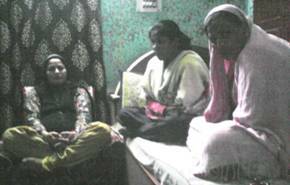 Then they went to one of the believer’s houses to pray for their sick mother or grandmother and, confident that God is going to heal her, Ps Ben exchanged contact details with this family as he committed to keep praying for her. Even though time was so short and limit, they had a great time. Pastor Roberts and Sis. Anita spent time with Pastor Obaid and Tarana, learning more about the situation in Afghanistan and underground church there and the very difficult situation for Afghan refugees in India, then all joined in prayer lifting these concerns before our loving Father and interceding for the Afghan people. That night we joined the Afghan church for a Christmas dinner honouring all those who had served the Lord as part of this body during 2013 – this is a wonderfully active body of believers with so many being honoured for their service to members of the church, in translating the scriptures and sermons, and in reaching out to Afghan Muslims (with 60,000 tracts given out during the year) – a faithful church like the Philadelphian church of Rev. 3:7-13 who have kept His command to persevere. The four missionaries had one last time fellowshipping together on this day before departing for our various nations. TUESDAY 24th DECEMBER: All boarded flights for home except Pastor Roberts who travelled to minister in Nepal until 1st January. Sister really we blessed with the seminar. Really very thankful to you because it is great privilege to me. thank God. I and my husband is very happy being with you in your ministry. Really I am seeing God’s Love in you. Please pray for my family and ministry. Convey my greetings to brother Robert and Benedict. My husband Pastor Joshuva sending greetings to you . Kindly pass on my lovely wishes to those who are in faith of Jesus. Hope to reply soon. 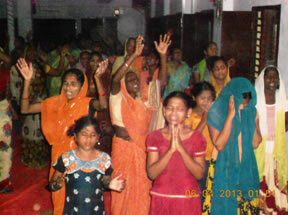 We can not forget God has done through your ministries in India. We all blessed through your ministries and encouragements. The vision and the burden you received from God is great and challenge. Wish you a happy new year. … … I was reading the books you presented to me, it is so powerful. it was great blessing for me this time and I am really so humble before your all efforts and vision in the ministry for this country. At the very out set thank you very much for your wonderful massages, and led us in the fasting prayers the way is unique in Hyderabad. I learn many things and I re- charged with Holy spirit. Thank you and thank God for provided me this great opportunity. I am grateful to you for a chance to translate your messages into Telugu language. May God use you in anyways to develop His Kingdom. I hope and pray for such opportunity with you again and again to learn more and more in our Lord. Please pray for me, for my work and for my family members. If our literature is translate in to Telugu language, it would be useful for large number of Telugu language knowing people, they will come to our Lord, if your send them, I will translate it in to Telugu language prayerfully. Sister you know, Andhra Pradesh is a big State in India. Please think about it. Please pray for orphan Children and Old age people. In one place in this hilly area prayer hall is very essential, because it is among Hindu idle worshipers, Your wonderful pray can get the things done. Thank you once again, and may God bless you all. We will never forget the beautiful people of India. Life-long friendships were forged during this mission, both between the missionaries and with the pastors and their wives in India. It was wonderful to see our Affiliates in India begin to work together and to see strong and humble men of God raise up so that we will be able to appoint Coordinators to continue the work of building unity and strengthening the churches in India.